Toronto, Ontario – August 19, 2014 – Maintenance Assistant Inc, a global leader in cloud-based Computerized Maintenance Management Software (CMMS), announces another solid quarter with business up over 50% over the same quarter last year. In addition to a strong financial performance, Maintenance Assistant added another record number of new customers spanning 22 industries including manufacturing, facility management, transportation & logistics, mining and healthcare. “Our growth is driven by sustained investment in new technologies”, said Daryl Sedgman, President. 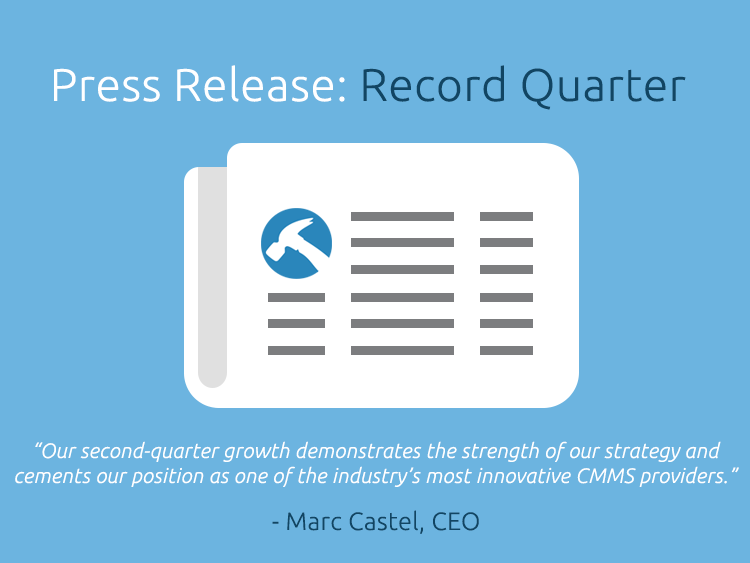 “In Q2, we continued to strengthen our core competencies in agile development, R&D and design by recruiting outstanding talent and significantly growing our development team. We continue to focus relentlessly on improving our core product offerings by delivering more enjoyable and intuitive user experiences. In late June, we hit an important milestone with the Beta launch of our new mobile application. MA CMMS™ Mobile is a hybrid native app for Android and iOS that resides on your smartphone but keeps your data safe in the cloud. It combines our patent-pending mobile on-boarding solution with a brand new mobile CMMS experience and is expected to be commercially available for all customers in early August”. Our roadmap includes a white label CMMS offering with a full provisioning system, an expanded MRO and re-seller marketplace, Machine to Enterprise connections, custom features and the much anticipated commercial launch of our API and SDK. Our goal is to make Maintenance Assistant the asset management platform for the Internet of things (IoT), and the launch of our API will put us in a strong position to achieve that goal”, said James Novak, Executive Vice President. “The API is built on our multi-tenant architecture using modern industry standards and intelligently manages the flow of data securely and reliably between MA CMMS™ and third party software and devices, making MA CMMS™ an actionable endpoint for our customers’ and partners’ data. Our strength is our technology and we see the roll-out of our Platform-as-a-Service (PaaS) as a key enabler for OEMs to quickly develop richly integrated, creative business solutions for their customers at a fraction of the price of building their own CMMS.